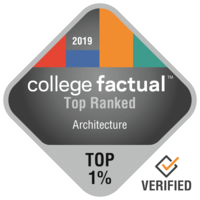 2019 Best General Architecture Colleges in the U.S.
Only 5,152 students earn a degree in General Architecture each year, which means it is ranked only 80th out of 384 in appeal. Graduates with a General Architecture degree have a 1.0% boost in pay in comparison with other college grads. This means the degree is positioned 47 out of 121 with respect to income potential. Architecture graduates will earn about $41,367 for their beginning career pay and $76,182 for their mid-career pay. Below you'll see a list of the best colleges and universities to study General Architecture. Our ranking methodology takes into account education quality, average earnings of graduates, accreditation, and several other relevant factors. The top ranked school in the U.S. for General Architecture is University of California - Berkeley. Graduates of the architecture program report average early career wages of $45,536 and mid-career wages of $85,950. University of California - Berkeley has one of the largest student bodies in California. It's hard to find a better school than Cornell University if you wish to pursue General Architecture as a major. In addition to its bachelor's programs, Cornell University offers graduate degrees in Architecture. Ithaca, New York is an ideal environment for college students who enjoy the fast-paced urban lifestyle. It's hard to find a better school than Rhode Island School of Design if you wish to study General Architecture. At Rhode Island School of Design, architecture learners enjoy the advantage of a highly focused curriculum. Positioned in Providence, Rhode Island, this school is best suited for learners who blossom in a city atmosphere. It's difficult to beat Illinois Institute of Technology if you wish to study General Architecture. In addition to its bachelor's programs, Illinois Institute of Technology offers graduate degrees in Architecture. Situated in Chicago, Illinois, this school is ideal for learners who flourish in a city atmosphere. Due to Illinois Institute of Technology's fantastic on-time graduation rate of 36.5%, students typically accumulate less debt than they would at other institutions. This school stimulates networking between students and their teachers, helped by the 13:1 student-to-faculty ratio. Get all of the crucial facts on Illinois Tech by viewing their scorecard. Any student pursuing a degree in General Architecture needs to check out Columbia University in the City of New York. Students who complete this degree state that they receive average early career earnings of $44,651 and mid-career earnings of $94,559. With over 20,000 students, this school is among the largest schools in the country. Virginia Tech is a great option for students pursuing a General Architecture degree. Graduates from the general architecture degree program at Virginia Tech make 3.8% more than the average graduate in this field. With more than 20,000 students, this institution is one of the largest schools in the nation. It's difficult to beat Texas A&M University - College Station if you wish to pursue General Architecture as a major. In addition to its bachelor's programs, Texas A&M University - College Station offers graduate degrees in Architecture. Situated in College Station, Texas, this college is ideal for students who prosper in a city atmosphere. Every student who is interested in General Architecture needs to check out University of Pennsylvania. University of Pennsylvania offers graduate degrees in architecture for those interested in an advanced degree. University of Pennsylvania is among the largest schools in Pennsylvania. Any student pursuing a degree in General Architecture has to check out University of California - Los Angeles. Graduates of the architecture program make an average of $45,834 in their early career salary and $86,050 in their mid-career salary. The setting in an important urban center is great for young people seeking out considerable opportunities for social networking, adventure, and exploration. University of Florida is a good decision for individuals interested in a General Architecture major. University of Florida offers graduate degrees in architecture for those interested in an advanced degree. Located in Gainesville, Florida, this school is a good choice for students who enjoy the thrill of a significant city. You shouldn't be concerned about affording University of Florida; 85.0% of their undergraduates get financial assistance. U of F features a high performing women's softball team. View a few school videos to discover what is happening on campus.